California police said a man was killed Wednesday in a highway crash after a truck driver fell asleep behind the wheel. The box truck involved in the crash was carrying "a very special load" for Apple, according to NBC's Bay Area affiliate. Sources told NBC the two men in the truck were armed security guards transporting products for Apple. Apple is known for being very tight-lipped and keeping its products and company documents under tight wraps. 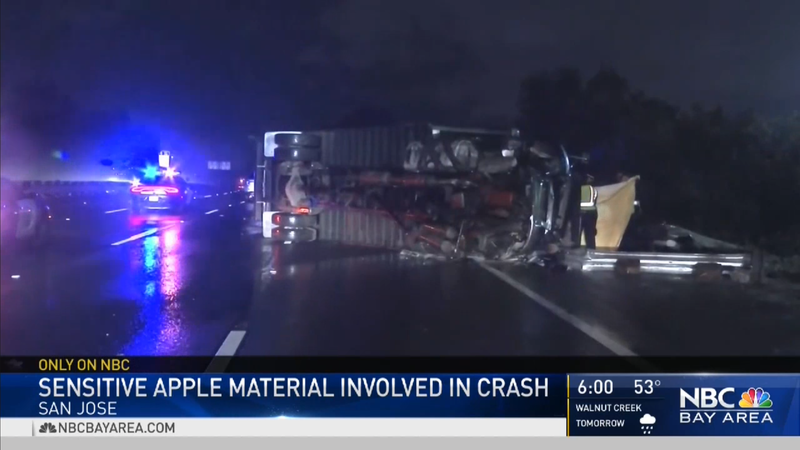 A truck reportedly transporting " highly sensitive products" for Apple was involved in a fatal crash this week in California. The man who died was one of two armed security guards in the box truck assisting the transportation of Apple items, sources told NBC's Bay Area affiliate. Both Apple and the California Highway Patrol did not respond to a request for comment. Authorities said the crash is still under investigation, and they don't know what the truck was holding, NBC reported. The crash occurred when the truck's driver fell asleep at the wheel early Wednesday morning, police told NBC. The passenger, who was asleep in the back of the box truck, was killed in the crash. The driver was injured. We are currently working a fatal collision on 101 NB near McKee. At this time, there is only one lane open. Expect delays and use alternate routes if possible. We do not yet have an estimation on when we wil be able to get the remaining lanes open. NBC said the coroner identified the man who died as Richard Bartolo, a 64-year-old retired police officer. Both Bartolo and the driver were working Wednesday for the security provider Security Industry Specialists (SIS), the company said in a statement. SIS said it would not release further details on the crash "out of respect for our employees and their families." "Rich was an incredible man who was loved by everyone at the Irvine Police Department," Irvine Police Chief Mike Hamel told NBC. "We thank him for his dedicated service to his community. Our thoughts and prayers are with his family." Apple does not normally use armed guards for its shipments to retailers. In a September 2017 video from Buzzfeed that showed Apple's preparation for an iPhone launch, products were transported and shipped using UPS. However, AppleInsider reported Apple has used SIS for the "vast majority" of its secure land transportation needs. In the past, SIS has been used to perform secure tasks such as disposing of shredded documents and transporting prototype devices, sources told AppleInsider. Apple is notable for its "insanely secretive" practices. Its products are kept under tight wraps ahead of announcements, and the company monitors employees closely for leaks. Jony Ive, Apple's chief design officer, has said "it would be bizarre" for a company like Apple not to be so secretive. "It just seems rather odd to be telling everyone what you're doing," Ive said during the Wired 25 conference in October. "I don't know many creatives who want to talk about what they're doing when they're halfway through it." The crash occurred near San Jose on Highway 101, which runs along the West Coast from Los Angeles up to Washington. The truck may have been en route to Apple's campus in Cupertino, which is about 10 miles from the crash site and accessible off the highway.